DEBORAH CROMBIE: I have been promising this recipe to my fellow REDs for some time and I thought today would be the perfect moment to share. We need something autumny/crispy/ yummy that will make our houses smell divine and keep us fortified for the week. 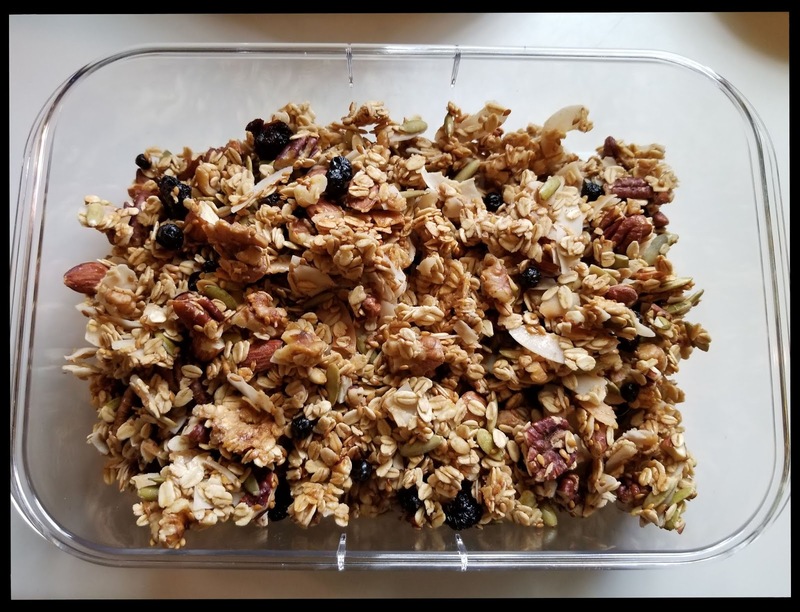 The original recipe is from Deb Perelman's SMITTEN KITCHEN and is called Big Cluster Maple Walnut Granola, but I've adapted it quite a bit. You can just call this version DEBS' GRANOLA. You can adjust your types of nuts and fruits and the amount of sweetener, but the most important thing is the egg white, so don't leave that out! 1--Preheat oven to 300 F. Line a baking sheet with parchment paper. 2--In a large bowl, stir together the oats, coconut, flax seed, cinnamon, salt, and the chopped nuts. 3--In a small bowl whisk egg white until frothy. Add maple syrup, vanilla, and coconut oil to the egg white, then mix liquid into dry ingredients. 4--Spread the mixture onto the parchment-lined baking sheet in a single layer about 1 inch thick. It should look like this. 5--Bake in the preheated oven for about 50 minutes, turning the pan at least once. Check regularly to make sure the granola is not burning around the edges. You might need to turn up the oven temperature just a bit. 6--When the granola looks golden, take the pan out and place it on a wire rack. I just use the top of my gas stove. Let it cool completely, then very gently lift up clusters of granola with a metal spatula. Here's where I really go off the reservation with this recipe, because for me at this point, the granola clusters are still very sticky. 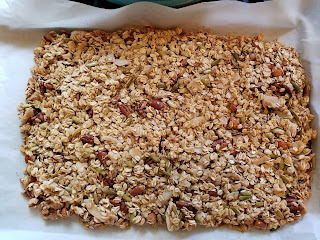 I put the pan back in a 200 F oven for at least 30 minutes, then turn the oven off and leave the pan in the oven until the granola is completely cool. I usually leave mine overnight. 7--When cool and dry to the touch, break granola into your desired size clusters. 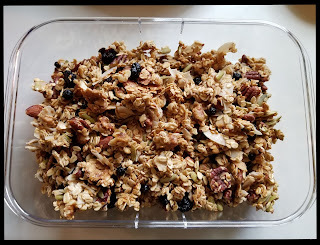 Gently stir in the dried fruit, then transfer granola to an airtight container. Here's my last finished batch. The really bad thing about this is that you'll never want to eat store-bought granola again! Enjoy, and tell us what you're cooking for autumn! This sounds delicious, Debs . . . thanks for sharing your recipe with us. What am I cooking for autumn? Sweets because I need some dessert to take to the women’s meeting at church. So, there are some cookies: triple chocolate, pumpkin white chocolate snickerdoodles, and chocolate cherry shortbread. And a triple-layered pumpkin bar with mascarpone frosting . . . . Yes I want the chocolate cherry shortbread too Joan! Form the dough into two logs, each about one and one-half inches in diameter. Wrap in plastic wrap and refrigerate for several hours [overnight is good]. Preheat oven to 325°. Line cookie sheets with parchment paper or a silicone baking mat. Do not remove the cookie dough from the refrigerator until the oven is heated and you are ready to bake the cookies. Bake 12-15 minutes, or until the edges of the cookies are lightly browned. Cool; store in tightly covered container. I love chocolate cherry anything - thank you!!! These are pretty easy to make . . .
You should cut the cookies about 1/4 inch thick. I love granola, and this version looks wonderful. But I have to know. What happens if you do leave out the egg white? That's exactly what it does. Thanks for explaining. The internet seems to suggest ground flaxseeds as a potential substitute for the egg white. I might have to try it that way. I am sure your granola is delicious, Debs, but I'm just not enough of a fan to make my own. Of course, I'd be willing to eat yours. Hahaha! It's been too hot here this past week to feel much like fall cooking, but when the temp falls to 75 on Wednesday, I'll start itching to fix some vegetable soup with those delicious fresh ingredients. Someone told me that they use Veg-All for their vegetable soup, and I shuddered. I want fresh carrots and celery and potatoes and onions in mine. I did fix a big pot of chili when I thought the temps were falling the other week. I may try some Halloween cookies this year. I have the cookie cutters for it. Pumpkin pie will probably wait until November, unless I decide to fix some to take to my brother when I visit this month. I made vegetable soup yesterday Kathy, with pimento cheddar scones. yummy! Kathy, my husband goes to the health food store once a month to stock up on granolas which I am not a fan of... at all. But when I make my own (similar to Deb's recipe... but Lucy's!) I eat it all the time. I'm the same way with cake. Rarely have I met a storebought one that seemed worth the calories. But homemade? Every time, yum. I'm with you on vegetable soup and chili. Not worth the calories is my line in the sand, too, Hallie. VegAll in soup? Why bother making homemade at all? I'm with you, Kathy. My vegetable soup recipe is so old it starts out with, "take a bucket of spring water". I've use some canned ingredients, but usually only beans. I don't even know what VegAll is! Oh Deb, VegAll is that canned mixed vegetables our mothers fed us. I loved it back then and can remember exactly how it smelled. I don't think I've bought canned vegetables other than tomatoes in 40 years. Lucy, my mother made pimento cheese, using an old grinder for the cheese and making her own mayonaise. When she died over twenty years ago, I knew I'd never eat pimento cheese that measured up again. I've never had the heart to try to make it myself. However, I'd love to have your recipe for pimento cheddar scones. Yum! Hallie, you have a good point there. Maybe I need to try homemade granola to appreciate that it can be yummy. Karen, what a hoot, "take a bucket of spring water." Debs, it's a good thing not to know what VegAll is. I didn't know until later in life. Ann, I never had VegAll growing up. I admit that I use canned corn in my beef stew and canned asparagus in my asparagus casserole. Kathy, my mom and grandmother made their own mayo and made pimento cheese from scratch, too. Is that a southern thing? One of our high-end supermarkets makes really good pimento cheese in their deli. Otherwise, I have to make it myself, because I don't like the premade supermarket stuff. Hallie, check out this bread book. I promise it will be so easy that you will be baking fresh bread daily. Checking that out! Thanks, Edith! My mother used to make granola all the time, but she used honey instead of maple syrup. Delicious, but sweeter than Deb's recipe. I am not a huge fan of cereal, myself, but Deb's granola is good enough to much dry, as a treat with your tea. No baking for me just yet, but when it gets a little cooler, I have an apple pound cake recipe that is just the thing for fall. I use honey, too, Gigi. Yum.. apple pound cake. I'll supply the tea, Gigi. This sounds fabulous - and reminds me of the recipe that The Girl used to make. Hmm. Maybe I should make a container for her to keep in her dorm room. I haven't really started my fall baking yet. The temperatures dropped, but then spiked again. But apple crisp is always a staple. Faster than apple pie and just as yummy. Mary, I'm with you on the crisp! We have a local, down-home cooking-style restaurant that makes great crisps--last two visits I've had peach crisp, then their cherry crisp--they make with whatever fruit is in season! Yum! Why do I keep forgetting about apple crisp? I will have to make it when the temps drop again. I’m on vacation so I’m not cooking a darn thing! 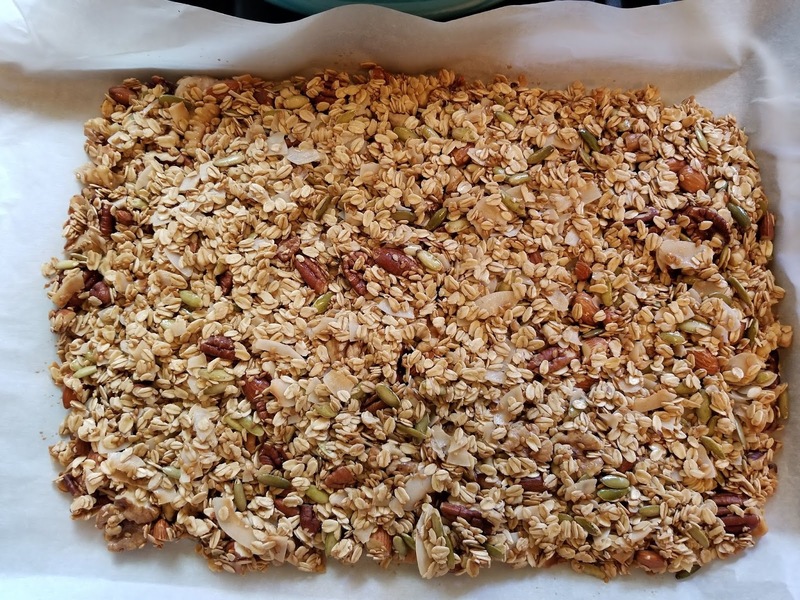 I love granola, but the problem with this recipe is that I have no 'off' button and would be sneaking a snack all day, every day, until it was gone. And then, of course, I'd have to make another batch! Homemade alphabet soup here, with double the vegs and browned and tender beef stew chunks cut into small bits for added umpf. Flora, it is good for snacking:-) But it's not very sweet, so a pretty healthy snack. Was going to make the above for our new neighbors today, but I have a gawdawful code in the head, so the cake's on hold. It is possibly the best ever apple cake. I've done it in a tube pan, a bundt pan and a sheet pan. All work equally well. The sheet pan takes a little less time to bake. If you haven't explored Tim and Victor's Joyous recipes, now is a good time to follow the link and explore. I may get up the energy to make Manhattan clam chowder tho. This is a vegetable soup, tomato based, with clams. Neither of us particularly like the New England variety, too heavy and too often thickened with flour instead of just potatoes. Besides, today, anything milky gags me. Maybe I'll stick to cups of hot tea with lots of honey and lemon and a good movie. I hope you feel better soon, Ann. And I will definitely check out that apple cake recipe. Feel better soon, Ann! I'll check out the recipes. Can you give us your clam chowder recipe? I've never made a tomato based chowder. At least that’s how I did it today! Thanks so much for sharing the recipe. 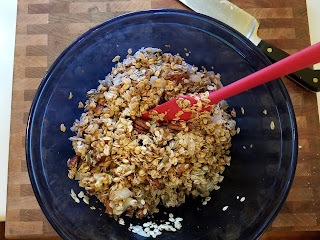 I think I have just about all of the ingredients and have been meaning to try making granola for some time now. I love granola! This looks like a great winter project. Thank you, Debs. thought a bit much, because the silly thing was in my arm. Now, I'm glad she is here really had no idea, obviously I've live a non surgically invasive life ��.... anyway, I was thinking we would get a bunch of vegetables and a box of great mushroom broth to make soup..... haven't done it but our intentions are good... I do have some bananas that starting to get a little over ripe....maybe bread, no kneading needed. �� The granola looks good, how long does it keep? Hi Deana, and best wishes on your recovery. The granola keeps for a couple of weeks--by which time it's gone, anyway, lol. I'd say three weeks if the humidity is not terribly high. Thanks, taking easy, I need to try your granola, I like it cottage cheese for a fast snack or breakfast. Deana, I usually have mine with plain Greek yogurt and berries or banana. I made granola in college, from Adele Davis's cookbook, I think. It was the best travel food for long bus trips to demonstrations -- much healthier than truck stop food. (Once we arranged a food stop in Chinatown before leaving NYC -- our bus drivers were move than willing to do so). When a food company introduced commercial granola, they arranged a tasting panel. One question was if we would trust their boxed product more than the barrel of granola at our food co-op. I said no, as I knew the people at the co-op. (I'd also seen the allowable percentages of various contaminants in commercial foods when I worked at a milling company). Homemade is SO much better. And all the commercial granolas are not only too sweet for me, but the grains always taste slightly rancid. I have never found a granola that I loved, so I am delighted to try this. Granola and yogurt for breakfast is my power food. This post and the comments are making me want to bake today! So many great suggestions! The chili suggestion got me! But I'm putting that off until NEXT weekend, when our lows are going to be in the upper 40s. It's so sticky and disgusting here today--can't wait for chili weather. I forgot to say that I also put half a cup of pumpkin seeds in the last batch of granola and they were delicious. I'm obviously doing a very high ratio of nuts to oats, but I don't eat a lot of it at one time. Normal breakfast serving about a third of a cup. And apologies for radio silence the earlier in the day--I was computerless, but am now back in business. This sounds delicious! Thanks so much, Debs! YUM! Just home from an event ,and STARVING--sot this sounds superly good! WOW! I signed on very late in the day (8:30 PM, PST)and after reading through the posts I'm with Hank. I'm starving. Let me say that I'm a big fan of baked oatmeal. Oats, almond milk, ground flax seed, cinnamon or pumpkin pie spice, chopped dates, apples and raisins. Baked, cut in bars and, if I'm really craving sweet, a very light drizzle of maple syrup. Enjoy.